I'm writing a document with multiple chapters. Each chapter has problems and each problem has a solution. 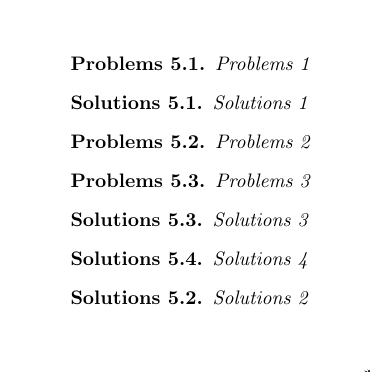 I want some of the solutions to be right after the problem and the others to appear at the end of the chapter. Unfortunately, that messes up the numbering of the problems. How can I fix that? Is there a better way of approaching the problem? When you come to solutions which should appear at the end, save the current solution number in a new counter and then step the solution counter (so following solutions are numbered correctly). Then, before writing the solutions at the end of the chapter, set the solution counter to this saved value. You loose the convenience of the \appto approach, but provided you do not have a large amount of end-of-chapter solutions I see the workflow as entirely practical. with exactly the same output as before. Not the answer you're looking for? Browse other questions tagged chapters theorems etoolbox newtheorem or ask your own question. Make \chapter* same as unnumbered \chapter (using memoir) ?